UrbanCincy: Is new funding structure needed as Metro braces for cutbacks? Is new funding structure needed as Metro braces for cutbacks? The Cincinnati region’s primary transit operator, Metro, is citing that due to the ongoing recession and a drop in city tax revenue that less service is in the cards. Metro says that they are “bracing for extremely difficult decisions in the coming months,” and that they are working with several different entities analyzing options to remedy the situation. This funding problem is one not unique to Cincinnati’s Metro as many major transit agencies across the nation are currently considering service reductions, fare increases or both to help address their budget deficits. Nearly half of Metro’s $94.6 million operating budget comes from the allocated 3/10 of 1 percent of the city of Cincinnati’s earnings tax. This earnings tax is projected to be some $2 million to $3 million less than originally anticipated. “The exact decrease is not yet known, but Metro is working with the City on alternatives,” says Metro who anticipates a $2 million to $3 million funding reduction by 2010. Another problem is that fare revenues are projected to be some $3 million to $5 million less than anticipated. These losses are attributed to the nearly 10 percent unemployment rate (fewer workers = fewer commutes) and recent actions by Cincinnati City Council that limited revenue growth by $600,000. 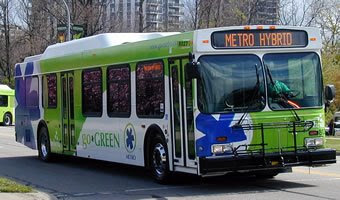 On top of all this, Metro has been notified that it will see a $137,000 funding reduction from the State of Ohio for elderly and disabled fare subsidies, and a $233,000 funding reduction from Hamilton County that would help provide service for people with disabilities. So far Metro has already done a number of things to help reduce costs including the restriction of non-essential travel; shortened call center hours; reduced printing transfers, system maps, bus schedules, brochures and newsletters; increased fares and pass prices; and even reduced service 3 percent in March and May. But what else can be done that would preserve the service of essentially the sole transit system in a metropolitan region of 2 million plus people? It is already being seen that the vast majority of stimulus money going towards transportation projects is going towards roadway projects and not transit. It has also been seen that many view mass transit as a luxury item rather than a necessary component of a metropolitan area’s transportation network. Metro is additionally challenged as the vast majority of its funding comes from one entity even though they serve a much larger area. A new regional transit authority was pitched by former councilman John Cranley as he was leaving office, and approved last October, but not much has happened since. A regional funding structure would not only diversify Metro’s funding sources, but it would also create a shared funding responsibility amongst the communities served by Metro. At the same time a regional transit board should be created that would operate one single transit authority (including Nky). This would reduce overhead costs and make for a more streamlined authority that could experience economies of scale within the workplace. This structure would also result in a comprehensive system that could be managed at a regional level instead of pieced together at a more micro level. I agree that a truly regional transit authority needs to be formed, and it needs to be structured in such a way to be free of petty local politics (i.e., COAST, Smitherman, et al.) and have the capacity to build and maintain major projects such as the streetcar, light rail, and/or subway. Ideally, I'd like to see such an authority structured similar to the Port Authority of New York and New Jersey, with jurisdiction over mass transit, CVG Airport, interstate river crossings, and expressways within and including the I-275 beltway. Airport user fees and highway tolls could then be used for badly-needed mass transit infrastructure investment, and major projects could be better coordinated with the good of the entire region in mind, rather than the current piecemeal approach that's always beholden to narrow parochial interests. I was chatting with your good friend S.L. over the weekend about this very topic. Perhaps you can help us solve a related puzzle. Metro's ridership is down 6%, which doesn't make any sense. We are literally the only transit entity in the USA whose usage has dropped during the recession. Even distressed areas like Cleveland and Detroit are flat, not down. You'd think unemployment could explain it, but other regions with much higher unemployment have increasing ridership. I suspect it might be due to differences in the types of jobs lost. Cincy's white collar employment remains strong. I think most jobs lost in the urban core are due to 2 major hotels closing, and lots of restaurants cutting way back or closing. Don't people who work for tips use transit at much higher rates than salaried folks? Could their loss account for the 6%? Your specific question is probably better directed at officials at Metro instead of myself. If I were to give you a response as to the specific reasons for the 6% decline it would be nothing more than speculation (similar to yours). I would imagine that the folks at Metro have a much more intimate understanding of the numbers than do I. But you may be on to something with the types of jobs as white collar workers tend to be much more favorable to rail transit or bus service like the popular express routes that Metro operates (I believe the ridership there has at the very least held steady). If we had a light rail system connecting one community with another to provide an alternative to automobiles then I believe we might actually be seeing an increase, but once again that's speculation since I have no hard data to back it up. The overall 6% might be due to the fact that it is these other jobs that have been lost. These people no longer have to commute anywhere and are therefore not commuting. Since there is no rail or robust express bus service in Cincinnati, there is nothing to provide a safety net for ridership. As you know, Cleveland has rail lines and a newly opened bus rapid transit route. Last year in Cleveland was flat; this year is way down. Hopefully Cincy has a different pattern. What do you mean by safety net? Rail & BRT don't duplicate bus service, do they? I thought buses were supposed to serve as collectors for high-cap rail routes. By safety net I mean additional riders that offered a diversified consumer base. If you rely predominantely on a certain type of rider, and they experience economic hardships, then you're going to face a not so nice ridership outlook. Cities with both rail and bus service have a greater diversity of transit riders. Rail is proven to attract new transit riders and add to the overall system's usage (that's why every city with both rail and bus has extraordinarily higher ridership numbers). Bus and rail networks do work together, but they also work separately. For example, you have a rail hierarchy (HSR, LRT, STC) just like you do a road hierarchy (Art, Col, Loc). Buses tend to work a little differently, as in Cincinnati it works on a spoke and hub pattern where the buses work within a fixed system (you the hierarchy of the #17 is no different than that of the #23 for example). The one example where this differs is if someone were to take an express route and then transfer for a local bus line...so the express service from West Chester to Downtown, then the #17 to get to the University. Hopefully that all made sense, and I hope you're not just asking questions to ask questions and that you sincerely care to hear the response. I know how you and your buddy S.L. can be sometimes. Sincere inquiry. We don't see eye-to-eye on streetcar funding, but we're still as committed to making our city work as you are. And right now that means keeping the buses rolling. I ask you because you're knowledgable on city issues and you think differently than me. Sometimes we have to reach outside the box, as they say. I don't know how well Metro really knows it's ridership. I have used the bus for some time, and while I have filled out a few questionnaires, I have never been asked for any serious demographic info. Maybe once - back when they were pushing the light rail issue. Well as you know Mark from other discussions we've had. I look to diversify investments, revenue streams and potential losses. This reduces risk in the long run and allows for a more stable operation. This is why I believe a more regional funding structure is needed for Metro as it relies too heavily on a few sources of revenue streams (the more the better). The same should be said for their customer base. our transit system needs to reach beyond the limited ridership it currently reaches. That means more express routes, maybe some bus rapid transit and certainly some form of regional rail system that will bring in another demographic of riders that may not be so vulnerable with economic shifts. Diversity is good in many respects. As I said it reduces risk long term and offers a variety of possibilities to grow revenues. Diversity in the sense of transit choices is also good as it will appeal to a greater number of people in society and make the system more attractive (would it be desirable to be able to drive but only have a Hummer and Civic to choose from). The current bus system also could use some upgrades, but due to Metro's limited revenue stream this is not currently possible. Something like GPS tracking that would allow for real-time arrival information would be tremendous. Articulated buses for heavily used routes would also be another plus. What ideas do you and S.L. have in mind that would improve our regional transit system and make it more stable financially?